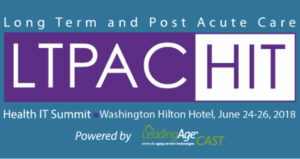 P athway Health’s Dan Billings, Chris Fangboner and Jane Burch are excited to attend and exhibit at the Long Term and Post Acute Care (LTPAC) Health IT Summit (HIT) this week – June 24-26. Taking place at the Washington Hilton Hotel in Washington, D.C., this premier health IT conference for LTPAC executives, information technology specialists and other key decision makers works to bring providers together to discuss how technology connects the health care ecosystem in the era of reformation and change. June 25 from 7:00 a.m. – 7:00 p.m.
June 26 from 7:00 a.m. – 1:15 p.m.